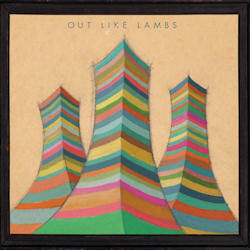 As happy I was to receive new music from Out Like Lambs, an indie lo-fi folk collective from New Jersey, I also felt sad after reading that their newest 10-Inch record would be their swan song. You don’t often come across bands that are able by using common ingredients to come up with their very own style. Out Like Lambs did so from that start, and I am grateful for the albums they released in their short time on this planet. This self-titled vinyl EP comes with a download code, so there is no excuse for those afraid of analogue technology not to check out the five once again superb songs of this ethereal sounding band. Some things have changed though. First of all, they used to play with up to sixteen musicians, but this time “only” ten members are listed in the credits. Also their songs are not as long anymore as they used to be. But that doesn’t count for the opener White Flags with its generous seven minute running time, offering everything that made me appreciate this band from the get-go. The assortment of instruments is huge like in the past, and you will hear vocals, keyboards, viola, banjo, harmonica, trumpet, drums, percussion, electric and lap steel guitar, tenor saxophone, flute, glockenspiel, omnichord and bass! The following River For Renee seems a little unpretentious as first, but the subdued vocals alongside the chiming glockenspiel make for an incredibly melancholic atmosphere which never touches on the trite, instead manages to awake real emotions. The B-side doesn’t stand back, with Older Whispers enchanting with the hypnotic organ sound of an omnichord. Stockton Lake Blvd is even something of an upbeat song. Ok, for any other band, it would still be slow, but for Out Like Lambs, this is a break from their otherwise even mellower sound. The concluding Something Big is with its five minutes slightly longer again and provides some more pastoral Americana indie folk. There are many indie, lo-fi and folk bands around. Most of them seem rather uninspiring to me. What always set Out Like Lambs apart from those lesser bands was their divine gift to make the impossible true. They were a big bunch of people, all playing different instruments, and still came out with something that never sounded overloaded. Their music always had the bare sound you would expect from such a band, except that their wide range of instruments gave them a richer, fuller and lusher sound. It was a great time I had listening to Out Like Lambs, and even if they decide to break up now, their music will stay in my heart forever!